Jasper Fforde – master of absurdity, champion of satire, ridiculer of bureaucracy, and proud Welshman – is back. If that sentence doesn’t fill you with a thrill of excitement then you’ve obviously never encountered Fforde’s particular brand of literary lampoon, and you should remedy that immediately. 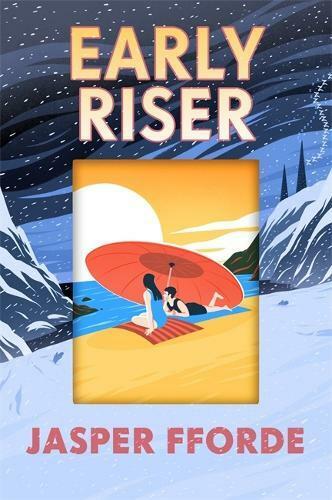 Early Riser is being touted as Jasper Fforde’s first standalone novel (giving hope to fans still waiting on the follow-up to 2009’s Shades of Grey) and it’s a fantastic introduction to an author who’s not nearly as well-known as he deserves to be. Charlie Worthing is the newest member of The Winter Consul, an elite band of individuals tasked with protecting the hibernating human population from Nightwalkers (zombies), Villians (Englishmen), and Wintervolk (Fairytales. Probably.). Stranded in the dangerous Sector 12 after being tasked with delivering a Nightwalker for reprogramming, Charlie finds himself caught up in a conspiracy involving unethical corporations, viral dreams, and a battle between an illegal splinter group named RealSleep, and the company that has made millions off monetising hibernation, HiberTech. Set in a universe that’s real-world-adjacent (They have Fawlty Dormitorium instead of Fawlty Towers, and Grand Theft Pantry is a crime punishable by death. Rick Astley’s still the same though. ), Early Riser is filled with all the documentary-style excerpts, running jokes, and wordplay that readers have come to expect from Fforde. It’s an hilarious, fast-paced, smart, and socially conscious novel that deserves to be read by anyone who loves Terry Pratchett, Douglas Adams, or Monty Python. Lian Hingee is the digital marketing manager for Readings.